We take many precautions to avoid sunburn on our skin, face, and lips, but have you ever thought about your eyes? Many are surprised to learn our eyes can also acquire sunburn. This condition is known as photokeratitis or snow blindness. Snow Blindness occurs when your eyes are exposed to ultraviolet light for an extended period of time, causing sunburn. It most commonly occurs in snowy areas because snow reflects 80% of UV rays. * Snow blindness can also occur in highly reflective environments with water or white sand. In addition to natural UV rays, man-made sources of ultraviolet radiation can cause snow blindness. Typically, man-made UV rays only damage your eyes when the proper eyewear is not being worn. This can happen when working with a welder’s torch or using tanning booths or sunlamps. Can I lose my vision completely? No, Snow Blindness is temporary and doesn’t cause actual blindness, it typically impairs your vision for 24 to 48 hours. Risk factors for snow blindness? 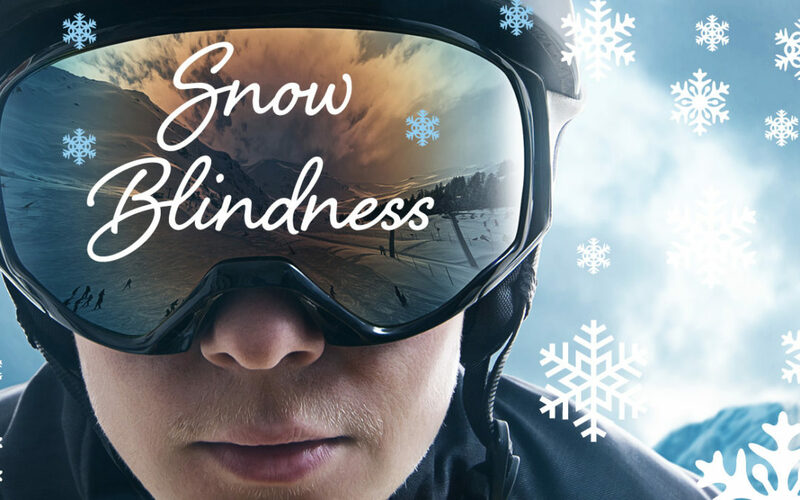 You and your family are at an increased risk for snow blindness when involved in sports with highly reflective surfaces. When skiing, snowboarding, and snow sledding, you should ensure everybody’s eyes are protected with snow goggles that provide 100% UV protection. Altitude plays a big role in the risk for snow blindness. At higher altitudes, UV rays are stronger. Therefore, when high altitudes, such as mountains, are combined with snow, the risk of Snow Blindness doubles. Don’t forget, water sports such as water skiing, knee boarding, and surfing require protective eyewear as well. A great option is wraparound sunglasses that block out 100% of UV rays and remain on your head throughout the duration of the activity. How do I prevent snow blindness? Anytime you are outside, you should wear sunglasses that block 100% of UV rays. Remember, UV rays can penetrate clouds, so sunglasses are required even on cloudy days. Always wear snow goggles when skiing, snowboarding, and mountain climbing. Wear wraparound sunglasses when you plan to be on or near water for extended periods of time. Ensure you have eye shields to wear in tanning beds and booths. Never tan without eye shields. Use the recommended safety eyewear for your job if you are working with harmful light.